With advance ticket sales for Avengers: Endgame getting ready to be made available to the public tomorrow, theaters are starting to ready for themselves for what’ll undoubtedly be the biggest blockbuster of 2019. 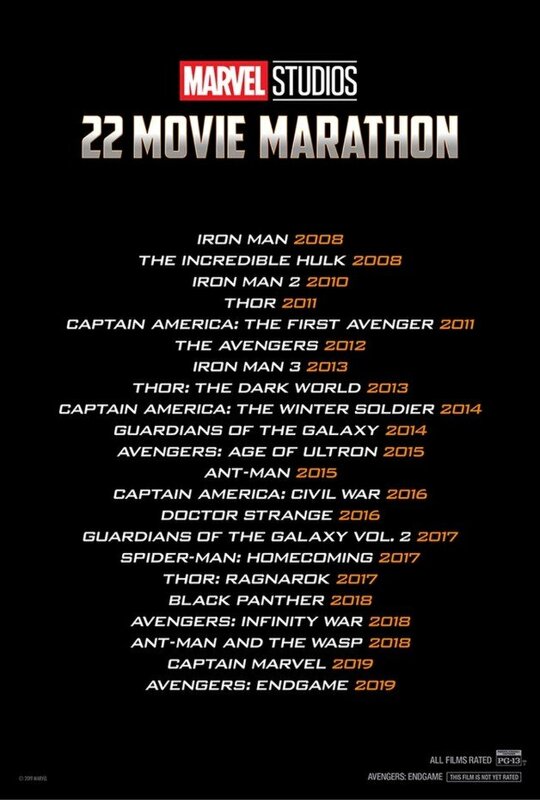 AMC, for instance, have now revealed that they’ll be hosting a 22-movie MCU marathon on Tuesday, April 23rd. As you may recall, last year Marvel Studios marked their 10th anniversary by bringing every film in the franchise to date back to cinemas as part of a multi-day marathon. And now that Endgame is about to bring the superhero saga’s current era to a close, it seems as if an even lengthier marathon is coming to theaters later this month. Seen in the gallery below is the list of films that will be shown, while the locations that’ll be holding the marathon are as follows: Lincoln Square 13 in New York City, River East 21 in Chicago, and Metreon 16 in San Francisco. Starting Tuesday, April 23, see 22 films from the Marvel Cinematic Universe all leading up to Marvel Studios’ “Avengers: Endgame”. “This premium event will include, marathon only collectibles, exclusive content, and a special concession offer. Plus, Avengers: Endgame will start at 5pm local time, one hour earlier than regular public show times. For those who may not have the time and stamina to see 22 movies in a row but still want to do something special ahead of Avengers: Endgame‘s release, know that select theaters are also hosting opening night fan events for the film. Details on those vary depending on your local theater chain, but suffice it to say, there are many ways to celebrate 2019’s biggest movie and with just mere weeks left to go now, the excitement is certainly palpable. Tell us, do you plan on attending AMC’s marathon? As always, you can sound off in the usual place down below and let us know.